For the first time since the 2015 season (and 1901-1960 before that when the franchise was the Washington Senators), the Minnesota Twins Double A affiliate for the upcoming season will not be the Chattanooga Lookouts (I’ll miss that logo…). That’s because the Twins struck a two-year Player Development Contract with the Pensacola Blue Wahoos (also of the Southern League) in the offseason to perhaps further their minor league development expansion efforts to one of the best facilities in the minors. While the Lookouts finished at the bottom of the Southern League North division standings while with Minnnesota for the 2018 season, the Blue Wahoos won a wild card in the second half before losing to the Biloxi Shuckers in the first round of the playoffs while an affiliate of the Cincinnati Reds. The Blue Wahoos appear to join the organization at a good time, as there’s a few top prospects in all the minor leagues that could spend a lot of time with them during the 2019 season. They appear to have a strong roster at the outset but may be even better in the second half if and when players are promoted. So here’s a look at the inaugural Pensacola Blue Wahoos roster and coaching staff for the 2019 season. Feel free to share any thoughts you may have on the team and as always, ask questions in the comments! Manager Ramon Borrego comes to Pensacola after spending seven years as the Twins manager in the Gulf Coast League, and then the 2018 season at the helm of the Fort Myers Miracle where he led them to the Florida State League championship. Steve Singleton will be the hitting coach and is very familiar with Borrego, as they’ve been together at both the GCL and FSL levels in the past few years. They’ll be joined by pitching coaches Cibney Bello and Justin Willard who worked together last year with the Cedar Rapids Kernels. The Blue Wahoos will be represented on the Twins 40-man roster by two players to start the season. There is not a member of the team who has played in the majors yet, though eight players have spent some time at the Triple A level, with 11 more having spent at least some time with the Chattanooga Lookouts in 2018 or at Double A in the past. Note that this is a tentative roster and can be updated before the minor league season starts on Thursday. Alex Kirilloff (Twins Daily #2 Prospect) – Best hitter not named Vlad Guerrero Jr. in all of MiLB last season. Brusdar Graterol (Twins Daily #3 Prospect) – Graterol is the Twins top pitching prospect. Blessed with a triple-digit fastball as well as improving breaking ball and changeup. 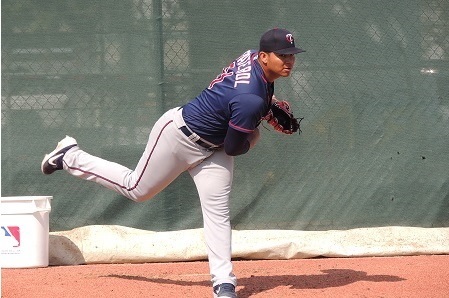 Jorge Alcala (Twins Daily #19 Prospect) – Like Graterol, Alcala can hit triple-digits with his fastball and will continue to work on his secondary offerings. Tyler Wells – Twins Daily’s 2018 MiLB Starting Pitcher of the Year. Has dedicated himself to fitness and diet as a pro and the big righthander will look to continue his rise among pitching prospects. Luis Arraez – Professional hitter with a .329 career batting average in the minors tied with only an 8.5% strikeout rate. Jovani Moran – Lefty reliever was nearly unhittable last year at Cedar Rapids, then improved when promoted to Fort Myers. Has a 12.6/9IP strikeout rate in the minors thus far. Arrow pointing firmly up. Taylor Grzelakowski – .828 OPS in pitcher friendly Florida State League in 2018. Standout in MiLB reports last year could improve that number even more in Southern League. Griffin Jax – Jax re-joined the organization in late-April as part of the Air Force’s World Class Athlete program. He joined the Miracle in mid-May and spent the rest of the season with the team. He posted a 3.70 ERA over 87 2/3 innings with the Miracle and then threw another 21 innings in the Arizona Fall league. Jaylin Davis – Strongly built outfielder will likely slot somewhere in middle of Blue Wahoos order. Power is tool to keep an eye on in 2019. What else can one say about Alex Kirilloff at this point? He’s the must-watch prospect for Pensacola to start the season, and it’s fun to speculate on if he can repeat the success he had last year in the upper levels of the minor leagues. He’ll start the year on the injured list but shouldn’t be on the shelf long. Brusdar Graterol and Jovani Moran are being challenged with the assignment to Double A to start the year after fantastic campaigns in 2018, how will they respond? Tyler Wells was fantastic during the 2018 season and is arguably the top pitcher on the staff to start the year. Will he be able to keep his arrow pointing upward as he faces stiffer competition in the Southern League? Can Tyler Jay reclaim any of his former top-prospect-shine in the mold of Kohl Stewart from the 2018 season? Are you suggesting that Alex Kirilloff will serve as the 3rd corner outfielder behind Jaylin Davis and Ernie De La Trinidad? I suppose it WOULD represent and new and creative approach to player development...something the previous regime wouldn't have thought of. Hard to complain about much here. Some really good looking prospects. Love it!! My expectation is he's there to fill in for Kirilloff and English while they're on the IL and will be back in Fort Myers when they come back, but you never know. What is ailing Kirilloff and when is he expected to be on the field? Great seeing him, Graterol and Jax all in AA to start the season.A bit surprised of the Jax move, but encouraging. Not a ton of star power in that lineup but a lot of those guys are sneaky good.Kiriloff and Arraez are the only young bats with star potential in the lineup. I really like Ernie De La Trinidad I know he is most likely a 4th outfielder type but he is a tough out and I like the way he plays.The Gryzz has some decent pop and a fairly good eye at the plate.A bit strike out prone but he has backup catcher\utility player written all over him. I have always been a big Jordon Gore fan.Not a great year last year but solid and he jumped levels.He too should have a shot to be a good utility player, maybe something more if he can find a bit more power.I like Kransons bat but he needs a bit more power if he plans to make it any further.It is a good group but the star power is a level below this one. There are a lot of interesting pitchers at this level and hard to say who will be able to perform or not.Should be a fun group to watch but as the article suggests there are players with greater potential already on the way. Aggressive promotion for Graterol. I like it. Its nice to see groups of players with major league potential making it to the upper minors. Hopefully next year this time, the Rochester roster will be loading as well. Nothing against guys who spend 8, 9 or 10 years trying to make it to the show, but I want to see double and Triple A loaded with talented guys trying to kick the door in. He had an awkward check-swing late in spring training. Came out of the game as a precaution and they did X-rays and MRI and it all came back clean... So, he shouldn't be out long. I remember a conversation with Toby Gardenhire in late May 2018 in Cedar Rapids... The organization was already having talks about what the best way to get him to the big leagues was and how quickly it mightbe able to happen and what was best for his long-term development. I'm a little surprised, but this decision fits in well with how they feel about Graterol's potential and readiness. This may be a silly sounding statement but everything here just makes sense. Other than Hamilton at catcher, based on his 2018, everyone looks like they belong. Defensively, at least, it seems the catching is very good. Sure wish Navarreto could actually learn how to hit one of these days, and develop some power with his size, because everything we hear about him defensively is excellent. Maybe im just nuts, but i have this feeling that in a couple of years Grzelowski is going to sneak on to someone's roster, if not ours, as an extra catcher, flexible position player with a decent bat and some pop. But with Garver, Astudillo in play, Rortvedt and Jeffers on the way, it may not be with the Twins. I find the infield solid but lean. Other than Arraez, just not sure there is a future MLer amongst them. But with Kirilloff and DeLaTrinidad you have the makings of a pretty nice OF! Not to mention hope Davis can take the next step. A little unsure about both Davis and Kerrigan, but there is some potential. English is the guy I'm disappointed/frustrated with. I have seen him as a better version of Granite for a couple years now but he can't stay healthy. Guy has the right approach at the plate, can run, plays great defense and has a good arm. Just not sure he's ever going to have the opportunity to really establish himself. How can you not like this staff? I am only mildly surprised by Graterol being here. I expect his IP will be monitored to some degree, but his stuff is outstanding and he ranks universally amongst the topp 100 prospects. Additionally, his "hero" is Berrios and he reportedly is doing all he can to follow his rigid training regime. Alcala has stuff that is at least close. Wells was the milb pitcher of the year for good reason. Jax is older than you like, which makes him a wild card, but the Twins gambled on him for a reason. And finally being allowed to peruse his dream, we started to see the potential/results in 2018. I don't find the pen to be anything outstanding, but Clay, Moran, Cutara and Stashak could change my mind quickly. (Mildly surprised Stashak isn't starting up at Rochester). Pleased and surprised to see Jay still around. I never really expected someone else to claim him. But a little surprised he's even with the Twins still. But pleased he gets one more shot at health to harness such a talented arm. Blast his selection all you want, kid has/had a really good arm with some wicked stuff. Final shot to see what he can do? Probably. But how many times have we seen a "last chance" and someone takes advatage of it? Heres hoping for tbe best. I see a solid staff, some big bats, some decent bats, good defense and some lineup versatility that should make this a quality first half club who gets even better the second half when...not kidding...half of the Ft Myers club could be ready to advance. I thought Arraez would be up in Rochester, but they do have a platoon of guys, minus Rooker and Gordon, who seem to be AAAA guys in the infield there. I’m excited to watch these guys throughout the year, but even more after the all-star break. As Tyler Jay isn't taking up a 40-man spot, I don't think this is a last chance. The Twins can keep him around for as long as they want and hope their lottery ticket eventually pays off. Thanks Steve and to the others that provided all the previews.Lots of players to track this season across the system.The TD Minor League updates are greatly appreciated for allowing us to do just that! Eventually, and I think not too far down the road, he can elect free agency. Can be a free agent after the 2021 season, if my math is correct. Longer than I thought. Three more seasons to try to make the selection work. Hey Doc B-As Tyler Jay isn't taking up a 40-man spot, I don't think this is a last chance. The Twins can keep him around for as long as they want and hope their lottery ticket eventually pays off. You are correct. Simply, what I mean and should have made more clear is he will simply be passed by very soon if he can't stay healthy and take the next step. Hence the last chance comment. Arraez only spent like 2 months in AA last year... There was no chance that he was going to start in AAA this year. 1- When I was makign my rosters, there was zero question that Caleb Hamilton was going to make this roster. He's come so far defensively behind the plate. Don't forget that in the playoffs for theMiracle last year they had Hamilton, not Rortvedt, doing almost all of their catching. 2 - Definitely NOT Tyler Jay's last chance. He's only been Rule 5 eligible once. He's got 2 more years before he's a free agent. He's left-handed. He's got good stuff. He's a hard worker. Unless things go really crazy, they aren't going to release him.